In honor of (what would be) Dr. Seuss’s 109th birthday, Oceanhouse Media has a huge sale on their excellent range of Dr. Seuss storybook apps for iPad and iPhone this week. 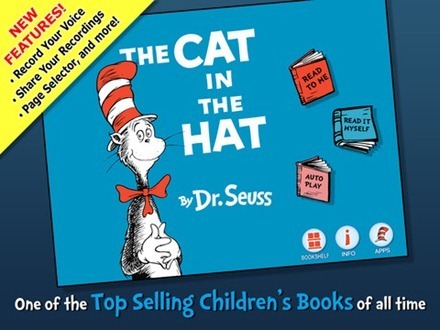 The Cat in the Hat is the featured book in their sale and celebration of this anniversary – the iPad storybook version is on sale for 99 cents (down from $3.99) and The Cat in the Hat camera app is free (normally $1.99). 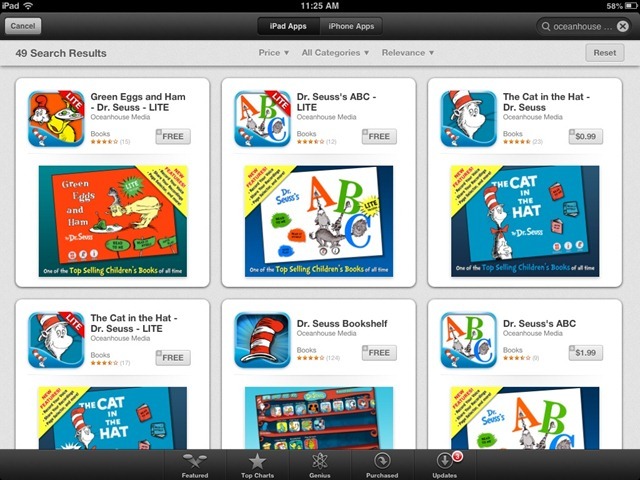 That’s far from all the good news for iPad-owning Dr. Seuss fans though. Oceanhouse also has more than 40 Dr. Seuss book, camera, and game apps on sale (with prices ranging from 99 cents to $8.99) until March 7th. The company’s titles for iPad include classics like Green Eggs and Ham, How The Grinch Stole Christmas, Horton Hears a Who, The Lorax, On Fish Two Fish Red Fish Blue Fish, Oh, the Places You’ll Go, and lots more. The best way to see all these wonderful apps is to search for ‘Oceanhouse Media’ in the iPad App Store – as you type it you should see a result for their name with dr seuss at the end of it. I’ve been singing the praises of these Dr. Seuss iPad storybook apps since back in the very early months of the iPad App Store. They’ve been among my selection for the best iPad apps of the year for 3 years running and were of course included in our Best iPad Apps of 2012 list. If you’ve got young readers, or readers of any age who appreciate Dr. Seuss, this is a great week to pick up some of these great apps.